Speakin' Geek: A bird, a giant and a boy. A bird, a giant and a boy. 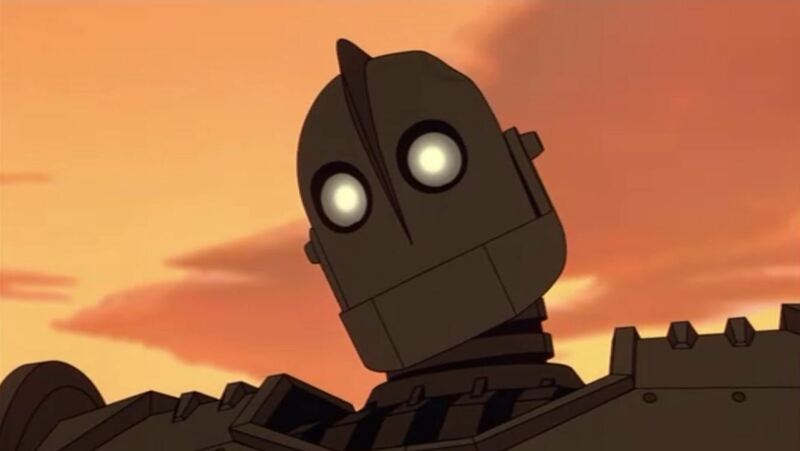 A week ago I ordered 'The Iron Giant' from Amazon, two days ago I received it and all the memories from my first experience of this film came flooding back to me. Every little joke, every little reference, was just pure magic. I couldn't wait to watch it,and I made sure to have the suitable conditions met while watching this film, so I got a brand new 42 inch television and I made sure to watch it with someone who had never seen it before(I know know, what kind of person hasn't watched this by now?). With all my conditions met we sat down and let the film begin. I'm conflicted, because I want you guys to understand the brilliance of this film but at the same time I don't want to spoil anything for you, so here goes, I'll try and keep everything to a minimum. 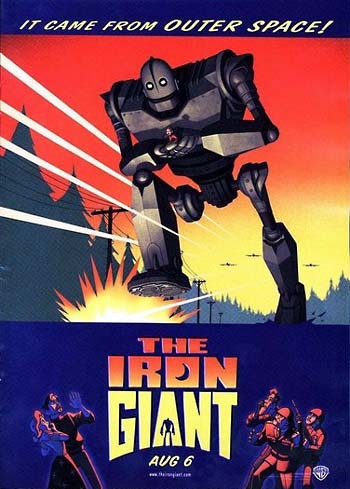 It's the 1950's, the Space race is in full swing and a giant robot falls to Earth, and a boy who needs a friend finds a friend. There that's all you need. Just talking about stuff, lad stuff. Where to begin, let's work up.The animation is superb,charming and picturesque. The style of the animation really showcases the style of the era. There is a warmth to the whole film which is just wonderful and welcoming. The plot is just fantastic, it has giant robots, armies and the space race but at its core it is about being true to yourself, not how society dictates who you are. It's all about your actions and how they decide who you are. It is a fantastic message that isn't pushed into your face but isn't shied away from either. The charm of 'Hogarth Hughes' is really great, he is a kid a little ahead of his time in my opinion. He is a lot smarter than most of his peers and elders. Then there is the Giant himself played with an amazing innocence and vulnerability by Vin Diesel. This is probably Vin Diesels best role that didn't involve him and a bunch of aliens fighting on a "pitch black" planet. See what I did there.....anyway. The Giant is fantastic, just so much fun and interesting. Even with this film there are one or two imperfections that come with it.These imperfections simply just come from aging and the fact that this film is thirteen years old. The voice acting quality is good, but not great, but once again it is really just down to the passage of time. This film should have been a timeless classic, instead it has been relegated to cult classic, nothing wrong with that, nothing at all but the ugly is simply this, Watch.This.Film. 'How I Finally Became A Film Reviewer'.